Let me start by saying… this was SUCH a delicious meal! : ) I made the seitan the night before, drained it, and put it in a container in the fridge until I was ready to use. I used my recipe for seitan and VCF’s recipe for the oven frying. I didn’t use all of the seitan, but certainly could have, because it was great. 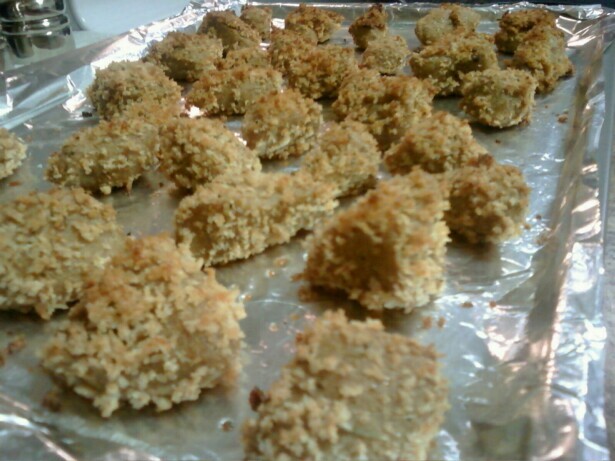 The batter was a dip in some almond milk & mustard, and a dredge in panko with seasonings & a spray of canola. I baked this at 375*F for 45 minutes. I started with a 350*F oven and threw 2 foil wrapped potatoes in there to cook while I prepped the seitan. Then I raised the heat for the next 45 minutes. Everything came out perfectly cooked together. 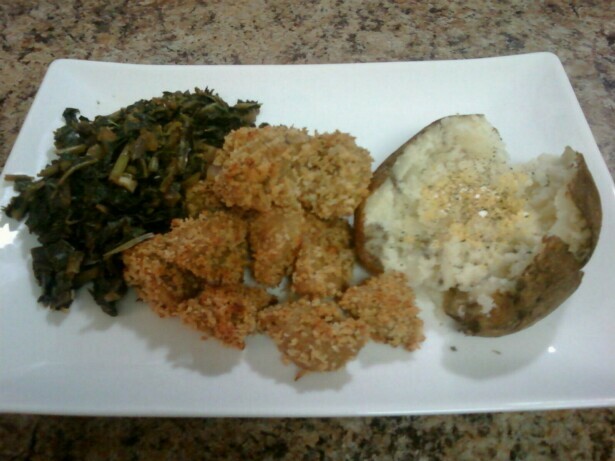 I served the potatoes with butter, nutritional yeast and salt & pepper. 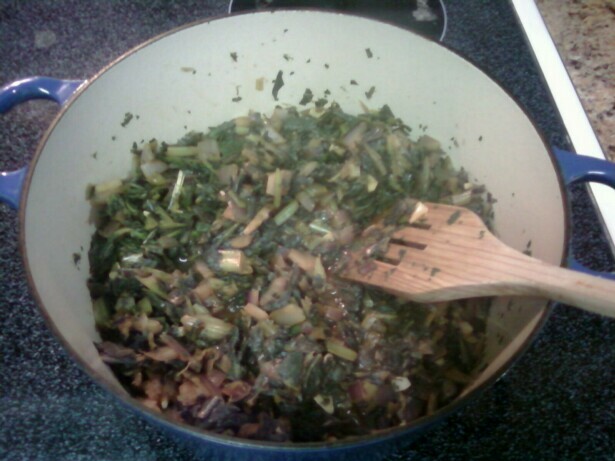 I’ve been meaning to take a crack at cooking collard greens, since they’re so nutritious. I read many, many recipes and came up with the recipe below. I never had traditional southern style collard greens, but I liked that they were not grease laden like the classic method. These came out okay, but I will try another recipe next time. Regardless, I posted my recipe below. 1. Heat olive oil in a medium pot, to medium heat and add onions and garlic. Cook until onions are translucent, about 5 minutes. 2. Add collards and water to pot. Bring up to a boil and add remaining ingredients. Lower to simmer, and cover for about 2 minutes. Simmer uncovered for 3-5 minutes.